A few weeks before Donald Trump's inauguration, and just hours before the passing of the light that was John Berger, I was looking at vibrant but plaintive representations of women's bodies in a small gallery in North Little Rock, Arkansas. There was a bronze one-piece bathing suit crumpled at my feet, and three paintings of quartered female figures hung on the surrounding walls. It felt like a weird twist in the spiral of history to be here in 2017: a woman ill-at-ease in her native South, with a handsy chauvinist flimflamming his way into the presidency. This very same man owned the Miss USA pageants for nearly two decades, and those perfected images of women with their frozen smiles and stiletto-stilted gaits streamed in to my childhood home and had made me uneasy even as a kid. I knew they were a fabrication, a disempowerment. This reductive imaging persists still in places like beauty competitions, ad spaces, selfie culture, and now the White House, where the abstraction of women into a sleek, airbrushed, and anonymous formality is one of the ways femininity is leveled and power is taken. Alika Cooper. Wet Suit II (2016); installation view, Good Weather, AR. Image courtesy of the gallery. 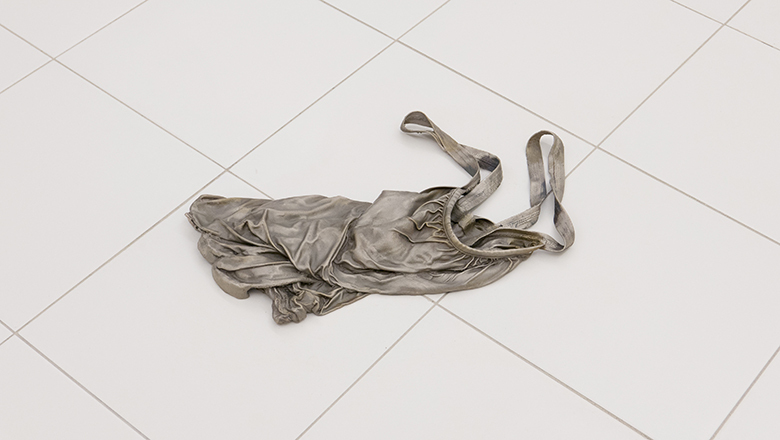 Alika Cooper's bronze sculpture titled Wet Suit II appears abandoned on a raised tile platform at Good Weather gallery. It was made through what the artist called "a kind of choreographed action that mimicked disrobing," whereupon a wax-drenched bathing suit was "flung" to the ground and then cast in molten metal using the lost wax method. For the paintings—which also quietly reference a disappearing craft, that of quilting—the LA-based artist began with solid cotton fabrics that were meticulously painted in gradients and then collaged onto panels. The photographs of Jacques Henri Lartigue and Helmet Newton, and those of 1940s bathing suit models were points of departure for the compositions, but Cooper's readings of the images involve her zooming in and dramatically cropping the female forms she's extracted from the fabric of Western visual history. These appliqué paintings at Wet Suits are on approach succinct, then sfumato, then scalpel sharp at closest proximity. 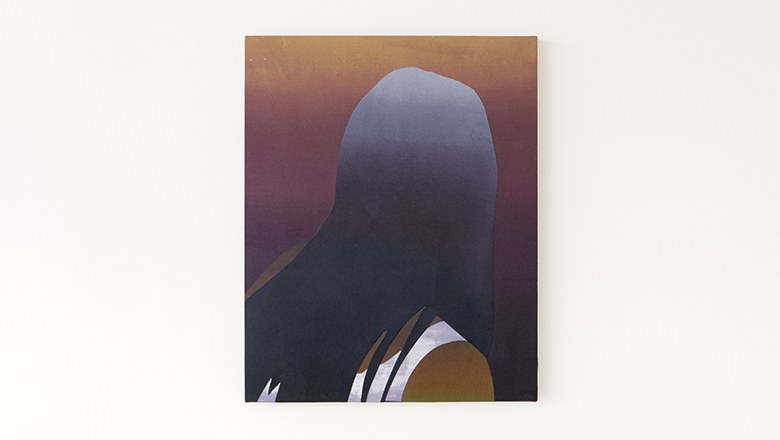 Light, in a warm gradient of polluted sunset, seems to emanate from within the female forms. The colors rush: sliced pamplemousse, an innermost ring of plum, chartreuse and peach fuzz, and then currant juice becoming the pitch of diluted ink. Wet skin and salt are evoked by the figures stripped down to their bathing suits, but these dank, earthly elements are decidedly not around. The painted fabric forms don't quite denote flesh, but are more like vessels for a Rococo-hued heat. While the panels are small—the largest being only 24 x 20"—the segmented framing of the figure suggests a monolithic and uncontainable force, like the wind roving over a landscape. Power and immensity are conveyed through the Picasso-like proportions and, paradoxically, through the fact that the women's bodies are fragmented and mostly out of frame. Like prehistoric fertility fetishes, the forms call forth a largely ignored, but primordial truth: beauty and power are simultaneously and irrevocably present in the feminine. In those visual lineages that have continuity with their ancient representations of femininity—as in the case of Indian art—women were depicted as equally animated and decisive as males from antiquity on, though many of those cultures have in the more recent past westernized their images of women. Images of figurines and their geographic origins. 1. Willendorf’s Venus (Rhine/Danube); 2. Lespugue Venus (Pyrenees/Aquitaine); 3. Laussel Venus (Pyrenees/Aquitaine); 4. Dolní Věstonice Venus (Rhine/Danube); 5. Gagarino no. 4 Venus (Russia); 6. Moravany Venus (Rhine/Danube); 7. Kostenki 1. Statuette no. 3 (Russia); 8. Grimaldi nVenus (Italy); 9. Chiozza di Scandiano Venus (Italy); 10. Petrkovice Venus (Rhine/Danube); 11. Modern sculpture (N. America); 12. Eleesivitchi Venus (Russia); 13. Savignano Venus (Italy); 14. The so-called “Brassempouy Venus” (Pyrenees/Aquitaine); 15. Hohle Fels Venus (SW Germany). In 21st century America, women—notwithstanding a privileged few—are encouraged to inhabit one side of the visual binary: empowerment or beauty. To be a woman taking power is to be desexualized, outcast, and resented (Hillary Clinton). The alternative—to be seen as beautiful, to be desired—means shrinking (to use Nigerian novelist Chimamanda Ngozi Adichie's term from the essay "We Should All Be Feminists") oneself down to the dimensions of an object to be acted upon. In our enduring patriarchy, women are still hyper-sexualized into banality, or abused into submission, or just simply ignored if they complicate the dichotomy of power versus beauty. This is often true in politics, it's sadly the case in the history of Western painting, and for most of us women, it's also regrettably true in our daily lives. Contestants compete in the swimwear competition during the 2012 Miss USA pageant at the Planet Hollywood Resort & Casino on June 3, 2012 in Las Vegas, Nevada. Photo: Isaac Brekken/Getty Images. Alika Cooper. Untitled (2016). Courtesy of Good Weather. "The absurdity of this male flattery reached its peak in the public academic art of the nineteenth century. Men of state, of business, discussed under paintings like this. When one of them felt he had been outwitted, he looked for consolation. What he saw reminded him he was a man." 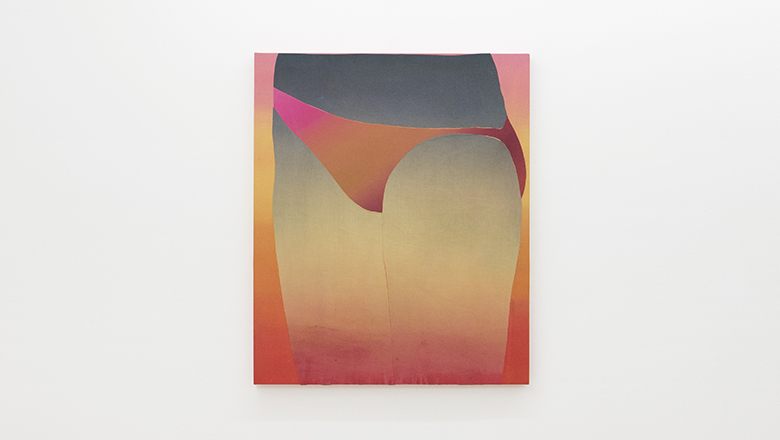 Women turn away from the viewer in the paintings at Wet Suits. Incomplete and shifting, their bodies inscribe movement, and thus volition. Turned away from us, black hair spills like oil over the bronzed shoulders of a figure framed within a Burgundy-soaked panel. The precisely cut edges describe the soft, curving, downward-moving line of a bare shoulder. She becomes a landscape, more of a dark floodwater roiling down a mountain than a figure painting. That women could possibly be grasped in a reductive image or, let's say, "grabbed by their pussies" is a lie that the weak and fearful tell themselves in order to feel power for a moment. This is stolen power, and misogyny itself is nothing more than the hateful realization that stolen power won't last. Women in their multitudinous particularity cannot be represented, unless they are perceived in the totality of their creative force, strength, and beautiful perseverance. Abrasive, singular, flawed, and miraculously resilient—these facets of femininity are what have been far too often underrepresented. The women in Alika Cooper's work call us back to this truth by returning us to that which hasn't been properly imagined in Western painting; and so her women turn away, or abandon their leaden garments, and they demand that we look again. Alika Cooper: Wet Suits was on view at Good Weather gallery from November 24, 2016–January 14, 2017.